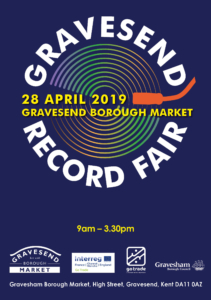 Brand new for 2019 – Gravesend Record Fair. A collection of many of the South’s best record dealers exhibiting alongside private sellers, offering everything from rock to soul, punk to reggae, psych to indie … and everything else in between! Whether you know what you’re looking for or just want to browse and explore the fantastic range on offer, come along between 9:30 and 3:30pm and support this inaugural record fair.